Summary: Learn how to configure your Skype for Business Server 2019 infrastructure to work with System Center Operations Manager. In an ideal world, you'd never encounter issues with Skype for Business Server 2019. However, Skype for Business Server can be affected by external factors—for example, network crashes and hardware failures. By using Skype for Business Server 2019 Management Packs, you can identify and address potential issues proactively. In this way, the Skype for Business Server 2019 Management Packs extend the capabilities of System Center Operations Manager. This information was written based on version 9319.0 of the Monitoring Pack for Skype for Business Server 2019 communications software. Identify and Configure the Primary Management Server. To do this, you must install System Center Operations Manager 2012 SP1 or R2. Identify and Configure the Skype for Business Server computers that will be monitored. To monitor a Skype for Business Server computer by using System Center Operations Manager, you must install the System Center Operations Manager agent files, and configure each server to act as a proxy. Identify and Install and configure watcher nodes. Watcher nodes are computers that periodically run Skype for Business Server synthetic transactions—Windows PowerShell cmdlets that verify that key Skype for Business Server components, such as the ability to log on to the system or the ability to exchange instant messages, are working as expected. Yes. Both on Skype for Business Server 2019 server and synthetic transaction watcher nodes. All internal Skype for Business Server 2019 server roles must be domain-joined. Skype for Business Server 2019 Edge Servers are not required to be domain-joined. All server roles in a deployment must be monitored from the same Operations Manager Management Group. Monitoring scenario availability with a synthetic transactions watcher node is supported (additional configuration required). Watcher nodes are not required to be domain-joined. The Skype for Business Server 2019 Management Pack leverages a variety of features to help you detect and diagnose issues. These features provide real-time visibility into the health of a Skype for Business Server 2019 environment. Windows PowerShell cmdlets to test and help ensure high availability of scenarios such as sign in, presence, IM, and conferencing for users. The synthetic transactions can be run from any geographic location including inside the enterprise, outside of the enterprise and in branch offices. When a synthetic transaction fails, HTML log s are created to help determine the exact nature of the failure. This includes understanding which action failed, the latency of each action, the command line used to run the test, and the specific error that occurred. Call Detail Records (CDRs) written by Skype for Business Server 2019 Servers reflect whether users are able to connect to a call or why a call is terminated. Call reliability alerts query the CDR database to produce alerts that indicate when a high number of users experience connectivity issues for peer-to-peer calls or basic conferencing functionality. Scenario coverage includes audio calls, peer-to-peer instant messaging (IM) and other conferencing features. Database queries that look at Quality of Experience (QoE) reports published by Skype for Business Server 2019 clients at the end of each call. These queries produce alerts that pinpoint scenarios where users are most likely to experience compromised media quality during calls and conferences. The data is built on key metrics, such as packet latency and loss, which directly contribute to the quality of user experience. Individual server components raise alerts via event logs and performance counters to indicate failure conditions that may significantly affect user scenarios. These alerts indicate a variety of conditions, such as services not running, high failure rates, high message latency, or connectivity issues. Skype for Business Server can fail for a variety of external reasons. The Management Pack monitors and collects data for critical external dependencies that can indicate severe issues. These dependencies include Internet Information Services (IIS) availability, and CPU of servers used for Skype for Business Server. High Priority alerts: These alerts indicate conditions that cause service outages for large groups of users and require immediate action. Outages detected by synthetic transactions and offline services (such as Skype for Business Server Audio/Video Conferencing) qualify as High Priority alerts. In contrast, a component failure on a single machine is not a High Priority alert. Skype for Business Server 2019 has built-in high-availability features for these situations—for example, multiple Front End Servers behind load balancers. Medium Priority alerts: These alerts indicate conditions that affect a subset of users or indicate issues in call quality—for example, component failures, latency in call establishment, or lower audio quality in calls. Alerts in this category are stateful (that is, the nature of the alert changes based on the state of the network connection.) For example, if call establishment times indicate latency but then return to a normal threshold, this Medium Priority alert would be auto-resolved in System Center Operations Manager and administrators would not need to take action. Alerts that cannot be auto-resolved are typically addressed by administrators on the same business day. Other alerts: These alerts are generated from components that might affect a specific user or subset of users. For example, a typical alert would be that the Address Book service could not parse the Active Directory® Domain Services (AD DS) entry for user: testuser@contoso.com. Administrators can address these alerts whenever they have time available. The following Table shows the health states of objects the Skype for Business Server monitoring pack. Represents the deployment of Skype for Business Server 2019 in the organization. Represents different geographical locations where services are deployed. A Pool (within a Site) that provides communications services, such as instant messaging and conferencing, to users. Applicable to Front End pools, Edge pools, and Director pools, even if there is only a single machine in a given pool. A server role that hosts Skype for Business Server Service. Represents a functionality deployed on a specific machine (for example, user service on fp01.contoso.com). A component of the Service (for example, the Address Book Download component is a part of the Web Service). An instance of synthetic transactions that are running against one pool. An instance of synthetic transactions that run against one Registrar pool. An instance of synthetic transactions that run against one User Services pool. An instance of synthetic transactions that run against one Voice pool. An instance of Port checks running against one pool. Performs HTTPS probing of the configured simple URLs in a deployment. A Skype for Business Server pool can contain multiple individual Skype for Business Server systems (with more than one Skype for Business Server role, Skype for Business Server service, and Skype for Business Server component). Therefore, the failure of an individual server or component is less critical to the overall health of the Skype for Business Server pool, because other servers in the same pool can provide the application service to the client. 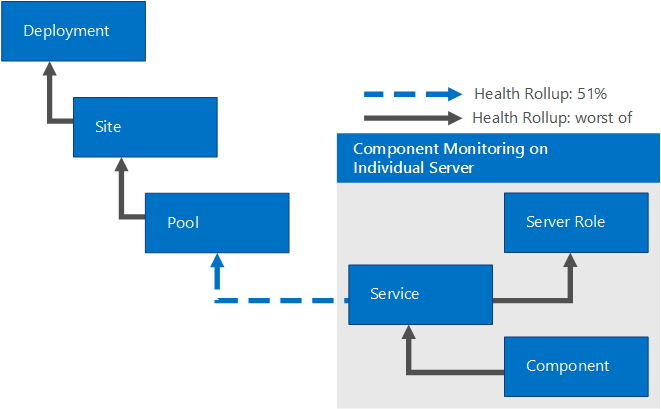 The health will roll up on a percentage level to the Skype for Business Server pool. 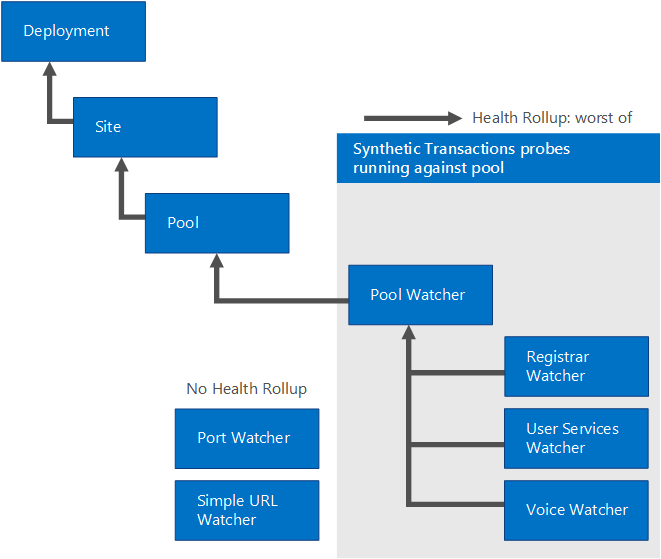 The Skype for Business Server Pool Watcher performs synthetic transactions against a Skype for Business Server pool. Consecutive failure of one or more synthetic transactions (a process known as the consecutive polling interval) will roll up the critical health state to the pool level (worst of any synthetic transaction), as shown in the following diagram. By default, Operations Manager saves all customizations, such as overrides to the Default Management Pack. As a best practice, you should create a separate management pack for each sealed management pack that you want to customize. When you create a management pack for storing customized settings for a sealed management pack, we recommend naming the new management pack appropriately, such as "Skype for Business Server 2019 Customizations." Creating a new management pack for storing customizations of each sealed management pack makes it easier to export the customizations from a test environment to a production environment. This also makes it easier to delete a management pack, because you must delete any dependencies before you can delete a management pack. If customizations for all management packs are saved in the Default Management Pack and you need to delete a single management pack, you must first delete the Default Management Pack, which also deletes customizations to other management packs. For questions about Operations Manager and monitoring packs, see the System Center Operations Manager community forum. A useful resource is the System Center Operations Manager Unleashed blog, which contains "By Example" posts for specific monitoring packs. All information and content on non-Microsoft sites is provided by the owner or the users of the website. Microsoft makes no warranties, express, implied, or statutory, as to the information at this website.